Rookie lessons are for riders who have had previous riding lessons or equivalent – students must demonstrate that they can sit saddle comfortably; perform an emergency one rein stop; hold & adjust reins; start, stop & turn horse; all lessons on Winning Ways school horses. Riders are to prepare their horses with minimal assistance from coach and her assistants. Riders will expand on the basics and progress to riding outside of the fenced arena and go on a trail ride. Adult Rookies may also enjoy the Safe Trail Riding Series. This series is suitable for those who have completed Just Startin’ Lessons or anyone with some riding experience. During a series of three lessons of approximately 1.5 hours each you will learn the ins and outs of safe trail riding. Learn saddling and bridling your horse, mounting and dismounting, steering and stopping, turning your horse and asking your horse to go forward. Learn safe practices around horses and horse handling. Prepare your horse for a fun 'practice' trail excursion in a controlled environment where you will utilize the basic riding skills to ride confidently. Learn to handle problematic situations in a fun and safe environment. Learn and practice trail riding etiquette. Learn safe riding on the trails with unexpected situations and how to maintain control and stay safe. 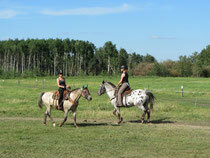 Each Safe Trail Riding lesson is approximately 1.5 hours in duration and a horse is provided. 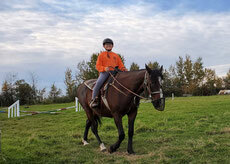 Lessons are held in an outdoor riding arena, then in a larger paddock and finally on the trail. On completion of the Safe Trail Riding Series you will be competent in controlling your horse in many situations encountered on the trails. All three lessons must be completed within 30 days.